Landing in time for Christmas is the Razer Kraken Over Ear E-Panda Hooligan Headphones. Yes it is a mouth full and like most hooligans, these badboys make a lot of noise – the good kind that is. 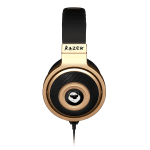 As you are probably aware, we are working on the ultimate Christmas gift list for 2013 and these limited released headphones should be high on the list of all those relatives who are into their music or online gaming. 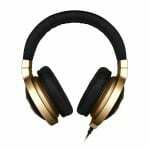 These amazing set of headphones get their name from Eric “E-Panda” Hernandez who is the older brother and session drummer to Bruno Mars and his own band – The Hooligans. Eric started drumming at the age of 4 and has been playing professionally since the age of 10. His years of experience had him revered as a master of all music styles be it soul, funk, reggae or rock and has allowed him to share the stage on drums with artistes the likes of Sting, Cee-lo Green (Gnarls Barkley), Travie McCoy (Gym Class Heroes), the Far East Movement. These credentials makes E-Panda the ideal person to add that creative and technical know-how to this partnership with San Diego based Razer. 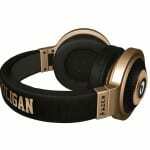 Without a doubt, these are a quality pair of headphones. The sound is clear and precise which is what you would expect from headphones around this price point (£89.99 RRP) but what takes these hooligans to the top of the class is the noise cancelling. Put these on and you will hear nothing else but rich high and mid ranges. The bass is equally as good when playing music but we have not been able to fully test them on the Xbox. Right here is where our team started slugging it out with each other. In the blue corner is Creative Director who believes the design team were given two briefs – make it stylish but also make it look like a gamers headphone. To quote, “they look great but over-engineered”. In the red corner coming out in full defence of the E-Panda is our Editor who thinks the styling is “retro with a splash of bling”. The build quality is really good and durable enough for regular usage wether you commute to work or put in 5 hours of GTA5 before lunchtime. If headphones were rated purely on sound quality, the Razer Kraken Over Ear E-Panda Hooligans would have taken all five stars. There are not that many headphones sounding this good for under £100 but the fact that the styling has divided our team means we have to give the Hooligans four stars. Available to purchase from www.razerzone.com.